People with snoring or mild to moderate sleep apnea often search for a simple, non-invasive treatment that does not involve having to wear a mask over the face, or be tethered by CPAP equipment during sleep. These individuals may be excellent candidates for a sleep apnea oral appliance. 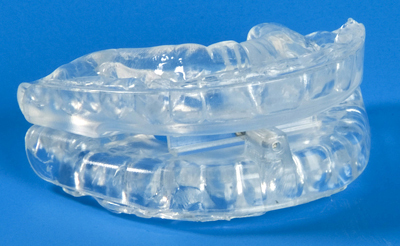 A sleep apnea oral appliance is a dental device for sleep apnea that consists of a mouthguard that is worn over the top and bottom teeth during sleep. While there are many different oral appliances available, nearly all are “mandibular advancement devices” that work by stabilizing or advancing the jaw forward slightly to allow the jaw, tongue and throat to be maintained in a favorable open position during sleep. 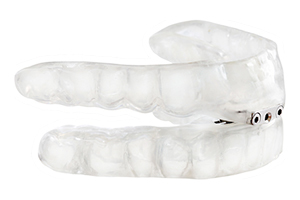 An oral appliance works best when it is custom-made and tailored specifically to a patient’s dental anatomy and jaw protrusive range (distance that the jaw can be naturally protruded forward). Most people are able to comfortably sleep with an oral appliance in place, although some can experience occasional drooling, soreness in the mouth, and temporomandibular joint (TMJ) tenderness. Dr. Phillips has several years of experience in creating and fitting custom-made oral appliances for snoring and sleep apnea, and he is excited to offer two different oral appliance options in clinic. He will work closely with each patient to maximize oral appliance therapy while achieving comfort.